Author Bio | Growth is Madness! Originally trained as a psychologist in the scientist-practitioner model, John Feeney, Ph.D., is today an environmental writer. After graduating from the University of Colorado at Boulder, he did his graduate work at the California School of Professional Psychology at San Diego. He later spent some years as a professional poker player, writing a highly regarded book on the subject. He began investigating environmental issues while fighting destructive residential development in a small town where he and his family lived for two years. His research pointed inevitably to the central roles played by population growth (teamed with the more publicized growth in per person consumption rates), the economic growth imperative, and our reliance on nonrenewable resources such as fossil energy in fueling the ecological crisis we now face. 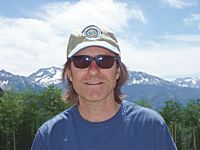 Today John lives with his family in Boulder Colorado, USA, where he continues to research and to write and speak about ecological topics. His current primary areas of focus are population growth and the media’s failure to acknowledge the gravity of the global ecological crisis.